A new cartoon aired on Monday called Adventure Time with Finn and Jake. After watching it with Kidlet I still cannot decide how I feel about it. It was weird. But the kids are raving about it and find it to be quite exciting! 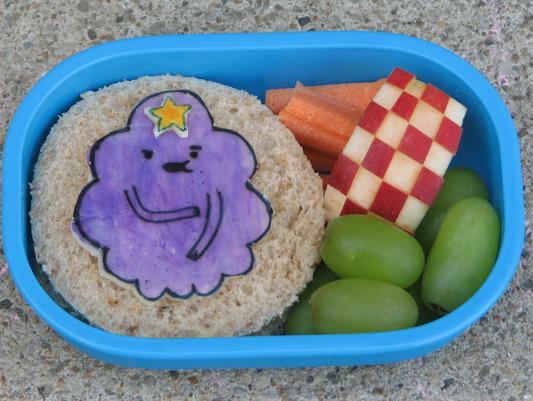 This is the Lumpy Space Princess. No, I am not making it up! She is food coloring on cheese and sits on a peanut butter sandwich. On the side are carrots, grapes, and a checkered apple. OMG! I LOVE adventure time with fin and jake and I'm almost 22!! LoL it's so weird but it's something totally different from all the other cartoons out there :p I'm jealous of Kidlet's Bento! !